First published in 1992, this book represents the first major attempt to compile a bibliography of Derrida’s work and scholarship about his work. 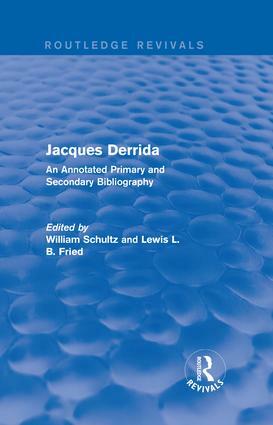 It attempts to be comprehensive rather than selective, listing primary and secondary works from the year of Derrida’s Master’s thesis in 1954 up until 1991, and is extensively annotated. It arranges under article type a huge number of works from scholars across numerous fields — reflecting the interdisciplinary and controversial nature of Deconstruction. The substantial introduction and annotations also make this bibliography, in part, a critical guide and as such will make a highly useful reference tool for those studying his philosophy.